Beautiful Costellations stencil for walls features a few zodiac constellations and various stars. Celestial motifs have been very popular lately, and our starry Constellation stencil is right on trend! 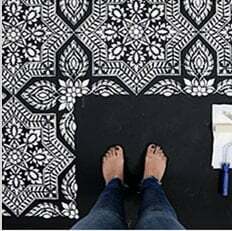 With this easy-to-use stencil you can create an amazing accent above a sofa or bed. This Constellations wall stencil also works perfectly for a celestial themed nursery. This celestial stencil design can be painted with a foam roller and/or stencil brushes. If you'd like to create a shimmering effect for your stencil and give it a beautiful glow, use metallic paint. You can even use a glow-in-the-dark paint to stencil the stars!